Last week, Damien Cave, the journalist entrusted with setting up the new Australian arm of the New York Times, started an email to subscribers with a contrast of rich and poor examples of Sydney. He then challenged readers to respond with how they saw these two worlds. My response didn't exactly match the brief but it was my response written from the heart and in the moment. I could have written about all these places that mean something to me for days or weeks on end but I only had a couple of hours to give it. Unfortunately, it didn't even warrant a mention in the follow-up article, Two Australias? Readers Tell Their Stories. So now I have to publish it myself. Here it is. Oh Damien, it’s so much more. You really haven’t explored much of Sydney or Australia yet. I grew up on 8 acres in Wagga Wagga, a place subjected to much ridicule and mirth. One day I will tell you about the Five O’Clock Wave. Wagga Wagga has a university, an army base and a RAAF base. It’s the central hub for surrounding farms and communities. My Dad was a NSW civil servant, originally designing roads, and then an assessor of budget expenditure. For instance, when councils would ask for money to repair roads damaged by floods, my Dad would check the legitimacy of the claims and then once the work was done, that the money was spent according to the claim. He became the enemy of a couple of council clerks. My Mum is a local historian. She has written the History of Wagga Wagga and many other smaller publications of various institutions, infrastructure and people in the area. 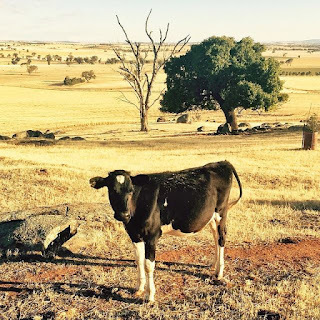 They now live on 60 acres in a place called Marrar (see picture above) where three council boundaries converge, Coolamon, Junee and Wagga Wagga. My dad has a whopping big shed he bought from the SES and it has a resident carpet snake. They regularly have brown snakes visiting too. I’m petrified of snakes. Thankfully, only baby snakes have actually entered the family home. Huntsmen spiders are also regular visitors, sometimes in the car. I had a friend from Sydney in my mini when a spider waved hello at her from the inside of the windscreen. I had to pull over to chase it away. Nearly thirty years later, she still points to the scar she obtained from the mad scramble out of the vehicle. To rile her up further, the boys we were meeting at the pub said they didn’t believe our story for being late. I moved to Sydney straight out of high school. The mini followed me after a month or so (my parents needed a replacement before they could release it). Meanwhile, each day I walked the main road through Belmore to catch a train to Bankstown where I worked as a trainee accountant. It didn’t take me long to recognise how white I was. White and skinny with long legs and red hair, I was subjected to the occasional wolf-whistle and honking horn. I attended Belmore Church of Christ most Sundays. My new friends ran a playgroup during the week that was mainly attended by Lebanese women and their children, even though they were usually Muslim. One mother asked the church ladies to show her children the baptistry and explain what it meant to be baptised in a Christian church since she wanted to give them choice. Sometimes I helped out at the ISCF (Inter-School Christian Fellowship) at Bankstown Girls High School. The first time I walked through the school grounds I was fascinated by the girls in hijabs, in school uniform colours. One of these girls attended ISCF. I went to a concert at Homebush Stadium, before it was the site of the Sydney Olympics. There were identical twin brothers sitting next to me and my friend. At the end of the concert they asked for a lift to the station. We were up for an adventure and drove them out to their home in Mt Druitt. When we arrived they tenderly moved their Mum in an alcoholic coma on the couch to her bedroom. I had my first unsweetened cup of tea due to the cockroaches crawling through the sugar bowl. There were locks on the boys’ doors to prevent their drug-dealing older brother from taking their stuff and selling it. Their 16 year old sister was pregnant. I used to laugh in the face of stereotypes presented to us on TV screens but here it was in front of me. These 19 year old twin boys though, were not the stereotype. They were both at manager level at McDonalds to support themselves through university and supplement the welfare payments the rest of the family was living on. One repeated Year 12 due to poor results the first time round and despite an improvement in the second HSC result, he only gained entry to Macquarie University through an Aboriginal support program. They were one quarter Aboriginal. I’m really sad that I lost touch with them after a few years. A year after moving to Sydney I started working for banks in the city and had glimpses of real wealth. Instead of completing financial statements and tax returns for small businesses, I was working with massive amounts of money. For three years I worked with Macquarie Bank where, particularly in my section, there was a strong work hard, play hard philosophy. A large group of us from that early 1990’s era recently had a reunion and the few that still worked for the bank said that it has changed. We reminisced about the lunches, the conferences and Friday nights. I held the female non-spew record for the number of tequilas someone could consume at their pre-wedding lunch. I lived in Neutral Bay for a while and made friends on the north shore. I met my now husband. I became jaded by the financial industry making rich people richer and opted out of this moral dilemma by having two children. I trained to be a teacher and now I work in north shore private schools and live in the upper north shore. The feeling of making rich people rich still irks me occasionally, mainly through the attitude of the parents. The north shore has this veneer of being relaxed, lately demonstrable through the increase in cafes, wine bars and homeware shops in my local village. We used to have two butcher shops, one of them became the trendy cafe, The Butcher’s Block. It’s a bit quaint, that term ‘village’, which we on the north shore use to describe our local shopping centre. I suppose it’s to contrast the bunch of small shops to the monstrous shopping malls. Underneath it all, everyone is working hard to maintain their huge mortgages, expensive cars, travel the world and pay those phenomenal private school fees. We just hope that these inflated housing prices stay there long enough so that we can sell our house at a peak and buy outside Sydney when we retire. Ballina is a gorgeous coastal town, a little below the more famous Byron Bay. A little below in wealth and prestige, as well as geographically. From the time I was five years old we’d spend summer holidays with my grandparents there and my cousins from Queensland would visit too. Unfortunately my grandparents are no longer there. My Pop died a few years ago and my Nan is a 101 years old and lives with my parents. The highway bypasses Ballina now and many of the shops I used to know have gone. The shopping mall to the south of what was the centre of town has killed them off. To me, Ballina is beach, long walks at night and cricket in the driveway. We were more scared of the bluebottles than sharks when we were young but with the number of sharks attacks lately, my attitude has changed. I actually miss the sand in the sheets and the salt in my hair. Beyond NSW, there is even more Australia that shows how diverse our land and its people are. 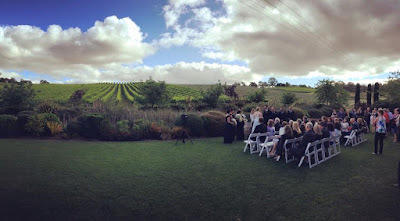 My brother lives in Adelaide (an Adelaide Hills winery pictured above) with their left-wing leanings but pommy accents. Brisbane tries hard to keep up with Sydney and Melbourne but really it is just another large country town. It’s further north you want to go, where the beauty of up-market Noosa and the humidity of Townsville and Rockhampton and more can grab you, wrap its arms around you and let you sink into its warmth. Or out west of Queensland, where my cousin has a zoo in the middle of a dusty plain. My husband’s aunt’s partner had a winery in Alice Springs which used to boast of being the first to bottle wine each season. Unfortunately, I’m yet to see the majestic Uluru or other amazing sites in our centre. I’ve never been to Perth either but I want to go to the Hopman Cup one day. They all seem a bit mad over there, the land that every now and again threatens to secede from the rest of Australia. Friends of mine have acted as the Kalumburu Community CEO. Kalumburu is a remote community in the far north of Western Australia, closer to Darwin than Perth. There is a strange mix of a Catholic mission, an Aboriginal community disenfranchised by paternalism and the white community workers. My friends returned to Sydney after their stints with more questions than answers as to how Aboriginal people can be helped. I have only visited Tasmania once, for my honeymoon a couple of decades ago. The ruggedness of the land is its main beauty and the convict history its ugliness. We visited Port Arthur before the massacre occurred but the history of its cruelty penetrated through my skin and into my soul. I grew up with a strong sense of Australian history but this is where theory became real to me. I’m sure the extra 35 deaths have added to the already extraordinary weight of the place. So there you have it, my Australia, and a little of my history wrapped up in it. I hope you come to love it, embracing its confused identity with warmth and laughter.